The multicopter board uses all through-hole components, so straightforward soldering skills are all that is required. The image below shows the finished board. (Some optional components are omitted). All the board components are marked to aid easy identification. The five small resistors at the top of the board (R1 through R5) are all 4K7, and the other two small resistors (R6, R7) near the LED's are both 220R. There is one diode and it is there to protect the components on the board should you inadvertently connect the battery the wrong way round. It is polarity sensitive and there is a black ring around the positive (anode) end. This should match with the symbol on the board and is towards the top of the board. Next add the 2 x 47uF capacitors (C3 and C7). These are polarity sensitive. The positive lead (always the longer lead) goes in the hole marked with a + (which is towards the top of the board). The 16MHz crystal (oval metal can) has a plastic mounting pad which goes between the crystal and the board. The crystal can be soldered either way round. Insert the processor socket and solder the pins. The semicircular cutout at one end of the socket should go towards the top of the board. When soldering the socket, initially solder two diagonally opposite pins and then check the socket is flat against the board before soldering the remainder. The two leds are polarity sensitive. Again the positive lead is the longer of the two and goes towards the top of the board. The Red LED (Alarm) goes on the Left. The Blue LED on the right. This is IC2 and is located near the top of the board. Its flat side should be towards the top of the board to match the outline on the board. As with the transistors, you may have to bend the middle lead for it to fit nicely. There are a couple of lengths of header pins included in the kit which should be cut down to make the external connections. 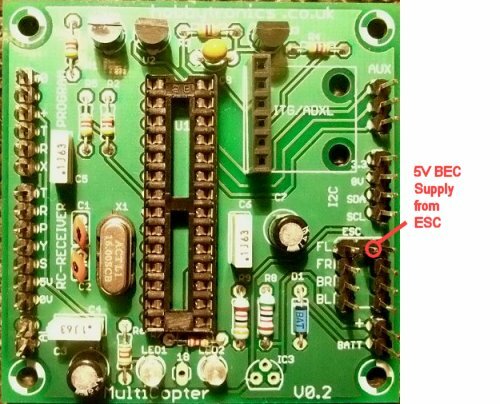 If you are going to power the board from 5V obtained by one of your speed controllers (ESC's) which have a 5V BEC supply then include the center pin in the esc connector (as shown below). If your are going to power the board via the optional 5V voltage regulator, then omit this pin. If you are going to use the ITG3200/ADXL345 Accelerometer/Gyro sensor board, then add the 6 pin female socket as shown above. Before going any further, it is worth checking that the 3.3V Regulator is working correctly before attaching any sensors that operate at 3.3V (Accelerometer/Gyro) and to also check the battery monitor voltage divider. Apply power to the board (by connecting the top speed controller connector if using that method) and check the voltage on the I2C connector pins on the right hand side. There should be approx 3.3V on the 3.3V, SDA and SCL lines. Connect up your battery to the BATT pins and check the voltage is not more than 5V at the top of resistor R8. The microcontroller should be inserted into its socket. This needs to be inserted the correct way round. There is a semicircular cutout at one end of the chip and this should face the top of the board. You will probably find the chips legs are splayed out a little and won't simply plug straight into the socket. They need to be bent so that they are perpendicular to the chip's body. This can be done easily by placing one row of legs flat on a table facing away from you and gently rolling the chip body away from you to bend the legs. Do the same with the other side and then push firmly into the socket. We are going to assume that your speed controllers (ESC's) have a BEC 5V supply and that this is used to power the board. This 5V supply is taken from only one of the speed controllers and is also used to supply power to the RC Receiver. The board has been designed to accomodate the ITG3200/ADXL345 Accelerometer/Gyro breakout board from Sparkfun. This unit will fit directly on the board, but other Accelerometer/Gyro boards may be used instead (including the Wii). We want the ITG3200/ADXL sensor as close to the board as possible, but it is also desireable that it can be removed if required, so we connect it using a socket. The get the sensor as close to the main board as possible, extract 6 pins from the remaining header strip and insert then into the socket as shown above. Next, using the nylon screws and spacers, add a screw and two spacers with a washer in between to each mounting hole (as shown below). Attach the sensor board and add the nuts, tighten and make sure the sensor board is level. Now solder the header pins onto the sensor board and trim off any excess. The four I2C bus connectors on the right hand side of the board can be used to connect to your desired Accelerometer/Gyro (including a Wii) and can also be used to add additional I2C sensors like barometric pressure sensors.